"Making foreign friends? Do not hard! " K-POP and K-DRAMA of South Korea and Asian countries as a show centered on increased interest in Korean culture. People's Republic of China came in for the drama ' stars ' with the impact of a Mac, and I had some time ago diaries TV craze, Russia also featured broadcasts of about K-POP at the open. This one seemed to reflect the popularity of the Korean into the number of visitors and an increase in the number of foreigners residing in the Republic of Korea and people's Republic of China. Inbound foreign travelers to South Korea in the year 2014 is 1420 million, live in the record, and foreign residents earlier this year based on 174 million and beyond, the entire resident population (5133 million) were 3.4 percent. The number of foreigners residing in Korea 11% increase in the new year. Increased interest for foreigners in the country's non-Summit, including the ' where is my friend's House about foreigners and foreign culture such as light on foreign programs getting a Pro to appear was able to easily see the sight. Those interested in foreign cultures or in a foreign language, centered around people who have an interest in foreign demand and want to make a friend. How to make foreign friends can take advantage of the most popular mobile applications where ' MIP (MEEFF) '. Abbreviation for the celebration of the FRIENDS MEET and FOREIGN-made MIP (MEEFF) is a full-featured location-based services that are being provided free of charge where I live near to find foreign friends of the service. MIP (MEEFF) was released in 3 months with Google play members of the zoom, and enough sensational popularity.
' 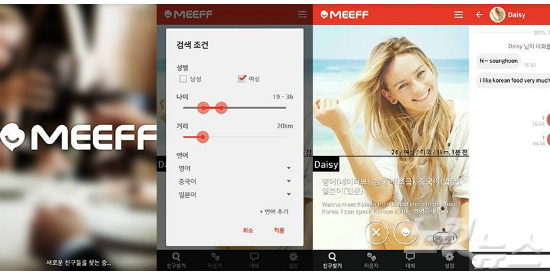 MIP (MEEFF) are operating on ' Oh, Hong Seok Korean for foreigners, "both sides want to be friends with each other, meeting between both sides to do this easy. Both the doctor and the need to meet the right guy doesn't have the greatest venue. Hongdae, Itaewon offline, such as a club or pub, meeting with an unknown person's liberty light this week, know each other's language exchange meetings, but looks difficult to unravel international having difficulty matching language "to solve these problems, said it would launch a MIP. Always was a foreign language. Only enlarge or writing in front of foreigners. Now it looks like this, and a year before a language exchange and lightly, a cup of coffee, or a Mac, you can talk to Chi, foreign friends through a mobile application you can find? We visited the Korean Language Institute of Korea university! !